If you are having issues remapping or if you want to make sure that it work as expected, there are ways to verify the path from which palettes, linked textures and linked drawings are sourced from within Harmony. Select any layer in the scene. If you want to check the path of a palette in an element's palette list, select that specific layer. In the Colour view, move the mouse cursor over the palette for which you want to check the path and wait for a second. The path to the palette will display in a tool tip. How to check the path of palettes and textures in a Colour-Override effect. In the Node View, locate the Colour-Override node and click on its Layer Properties icon. In the Timeline view, right-click on the Colour-Override layer and select Layer Properties. In the Whole Palette Overrides list, move the mouse cursor over the palette for which you want to check the path and wait for a second. 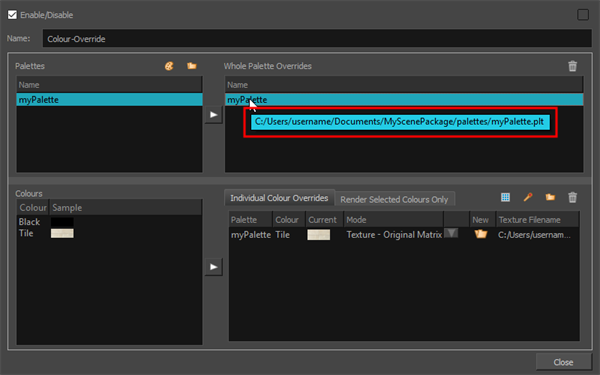 In the Individual Colour Overrides list, you can see the path to each linked texture in the Texture Filename column. 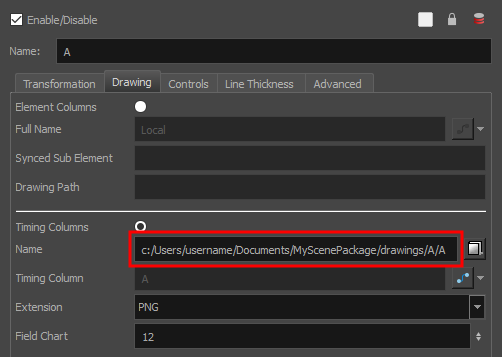 In the Node View, locate the drawing node and click on its Layer Properties icon. In the Timeline view, right-click on the drawing layer and select Layer Properties. In the Timing Columns section, check the path in the Name field.